European leaders have put pen to paper on a new treaty they say will bring the bloc’s debts under control. The so-called fiscal compact, driven by France and Germany, was signed in Brussels earlier by all but two of the EU’s 27 countries. Newly reappointed EU Council chief Herman Van Rompuy hailed the deal. “The restoration of confidence in the future of the eurozone will lead to economic growth and jobs. This is our ultimate objective. The targets on deficits and debts are intermediate targets – no aim in itself,” the EU Council President said. The UK and Czech Republic did not sign the new treaty. On his arrival, British Prime Minister David Cameron was keen to stress talks would also focus on Syria. “What I think matters is building the evidence and a picture, so we hold this criminal regime to account, and to make sure that it is held to account for its crimes that it is committing against its people and that one day, no matter how long it takes, there will be a day of reckoning for this dreadful regime,” Cameron said. The new budget pact will now go to individual parliaments for ratification while Ireland has said it will hold a referendum on the treaty. 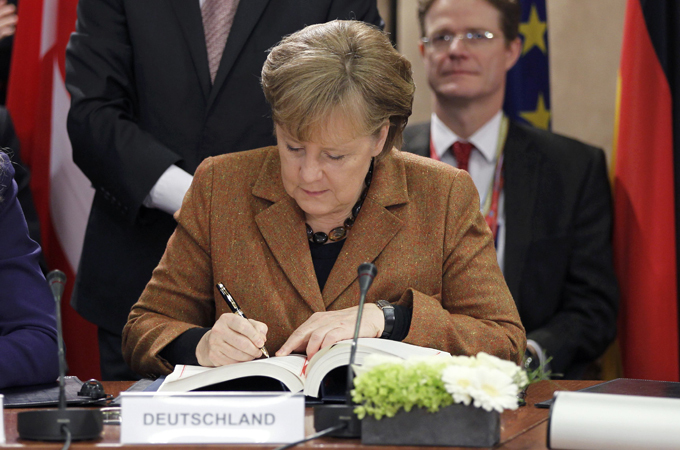 Germany’s Angela Merkel described the agreement as a “major breakthrough”.